The Bill of Rights: Protecting Individual Liberty or the Corporate Franchise? David Trimble has an interesting essay on Bishop Lee’s remarks to the Virginia Diocesan Council. At Council the bishop said, ““If the attorney general’s view of the law prevails, it will mean that the Commonwealth of Virginia gives preference to churches with congregational governance, discriminates against churches that are hierarchical or connectional in their governance, and intrudes into the doctrine and discipline of communities of faith.” The bishop asserts that religious liberty, in the context of the Virginia Statute for Religious Freedom and the First Amendment protects hierarchical churches – which is so absurd it shows an incredible lack of understanding about the context of religious freedom in the Commonwealth and in the United States. It is important that we read these statutes ourselves and not rely on others to tell us what we to think. The same think applies to the scriptures – which is why we are in this mess in the first place. A biblically literate laity is a fearsome thing to clerics, bishops and clergy alike. At the same time, constitutional literate citizens are equally fearsome. The bishop appears to think that Virginians have forgotten about Patrick Henry and George Mason and Thomas Jefferson and do not known their own history in the Commonwealth, nor have they read either the Virginia or the the United States Constitutions lately. Read, mark, learn, and inwardly digest them. We ignore those things at our own peril. But one can be certain the Attorney General of the Commonwealth of Virginia knows knows his history and knows what those historical documents say and mean and it’s his job to defend the Constitution and Statutes of the Commonwealth of the Virginia. 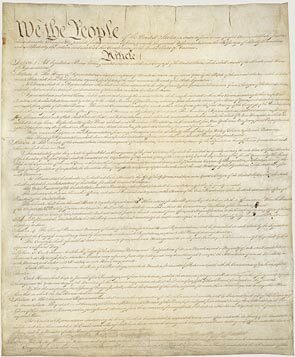 What makes American history – and Virginia history – so extraordinary in those founding documents was that our founders recognized (and sometimes after fierce debate) that our rights are secured as individuals, not to the class, the organization, the group or associations we belong to. There are no implied trusts in Virginia. We threw off the chains of slavery and when we found there were still more in chains, those were thrown off as well by force. “It is for freedom Christ came to set us free,” and Virginia has learned the hard way that some are not more equal than others. There is no “in club,” no “upper class,” no hierarchy that can impose its will and take those freedoms away. No, not even the Episcopal Church. It is not the “freedom of the church,” Bishop Lee – it’s the freedom of individuals to worship freely. He scorns the freedom of individuals when he warns the Diocesan Council that the Attorney General’s actions will cause “the Commonwealth of Virginia gives preference to churches with congregational governance.” Congregational governance means liberty for the individual. Bishop Lee should be ashamed to publicly twist the meaning of the guarantee of our individual religious liberty to mean a guarantee of state-protection for corporate institutional entities over the constitutional rights of individuals – as if. We can only imagine what Mr. Jefferson would say about that. Read David Trimbles’ essay here. This entry was posted in Episcopal News. Bookmark the permalink. ← If a picture paints a thousand words, then what’s up with the Lambeth Logo? Bishop Lee and the others of his ilk have enthusiastically blacksmithed the canons of the church to their whim so it is an easy thing to move up to the Constitution as the next impediment to remaking the church in their image. It is worth noting that efforts to disallow corporate political contributions have been stymied on First Amendment grounds — money is seen as speech and corporations, in the eyes of the law, are not distinctly different than individuals. So restrictions on corporate contributions are as unconstitutional (so the reasoning goes) as abridgement of the rights of individuals to free speech.As you are quite well aware, legal reasoning and “common sense” do not always align, but judges rule on the former. I’m not so certain the Diocese of Virginia’s argument won’t find some traction. It’s not Bishop Lee that flunks con law. You and David Trimble are apparently saying that individuals have rights, but when individuals come together as a group, they don’t have rights. That’s not just wrong, that’s absurd. Ask your lawyers– there’s a reason that argument will never be made in court. It’s not just that it ignores free exercise law; it ignores free speech law, freedom of association law, …And last I checked, bb, no one was stopping you from worshipping however, whoever, whenever, and wherever you choose. Or are you incapable of worshipping without your building? Congratulations, you can reprint the text of a statute. Of course, that fails to respond to either point I made in my previous post. And a church is a group of individuals. Anon, +Lee is pulling a stupid political ploy in crying victim about the Commonwealth of Virginia, possibly (no verdict has been announced) ruling against him.There is no infringement of the free practice of anyone’s faith. Truro is worshiping as they have been, DioVA is worshiping as they have been. Truro congregation holds deed to the property and in the late seventies a canon was passed that says it;s held in trust. The Division Statue has been on the books since before the Civil War.No if +Lee is really upset about 57-9 than why did he not campaign against it in 1997 or even in 2005? That is how you can tell it’s all a political stunt.A shameful one since 1 in 10 Christian actually do live in hostile situations and some pay the ultimate price for their faith. +Lee’s abuse here is a insult. This is a nasty divorce of two groups of people who once did get along and now it’s the fight over the house and kids. The Attorney General has a right to express a position on any case (as do any interested parties), but it is not persecution that he expressed an opinion different than +Lee’s any more than +Lee is persecuting the Commonwealth with a resolution on immigration.+Lee needs to get real, he needs to repent of ‘crying wolf’ when real Christians are suffering for their faith in North Korea, Burma, Indonesia at the hands of Columbian rebels (sadly this list goes on). Wait a minute! TEC is not a hierarchical church. There is no Pope! TEC belongs to a body of churches/provinces in the Worldwide Anglican Communion. They are not hierarchical!